I woke up Saturday morning and had the urge to drive and take photos. I decided to head to my family’s farm in Greenbrier, Arkansas, but decided to forgo the usual 2.5 hour drive on I40 and concentrate on 2-lane roads. I ended up spending 7 hours driving, shooting, hiking and hanging out with my dog. I headed from Fayetteville through Wesley and Huntsville toward Ponca, then onto Jasper. We stopped in Ponca to see the elk that always seem to linger in the field along the Buffalo National River. I honestly am not really sure what roads I took after Jasper. I think 74, 16 and 27 sound familiar, but I just watched my IPhone map and headed slowly toward Hwy 65. As we drove, we ended up at Pedestal Rock Loop in the Ozark National Forest and stopped for a quick hike. While it was beautiful, I’m sure I looked crazy as I swatted at mosquitoes while hiking the 2 mile trail. I have seriously never been bothered so badly by bugs… it was pretty entertaining as I imagined what I looked like walking along flailing my arms. The drive was beautiful, and the time with my dog was awesome… she’s a good traveler and a great companion! We ended up at the farm (aka “The Land”) and spent a couple of days wondering and relaxing. We are in the process of thinning pine trees, so I spent a little time photographing the woods and the work there. Sometimes taking a trip that’s not about the destination is a great change of pace. 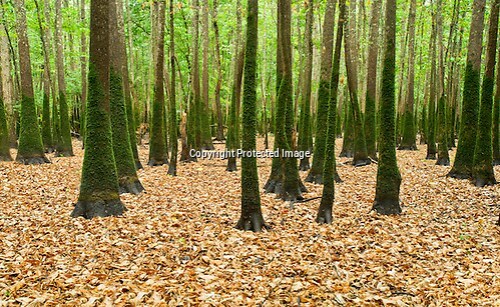 A grove of hardwoods covered in moss on the north side of our property. Young pine trees being harvested and thinned.